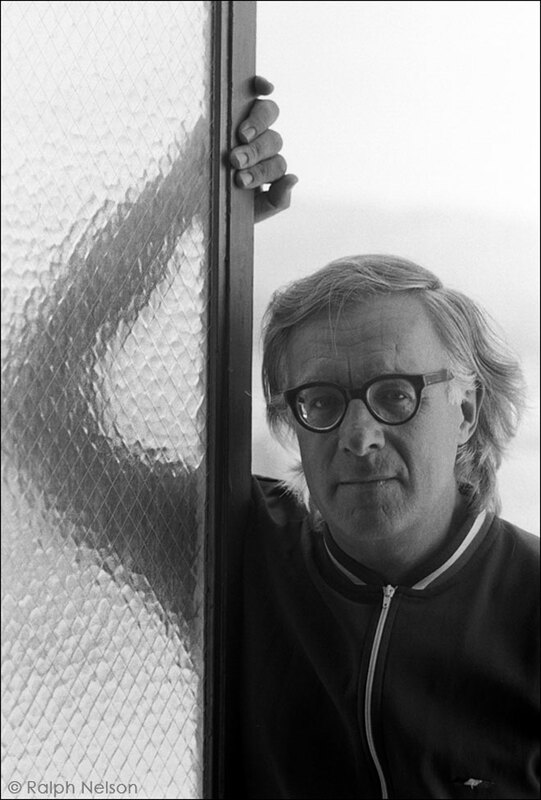 If you're a genre fan, chances are you've been reading a lot of obituaries of Ray Bradbury over the past few days since last Tuesday, June 5, when the titan of science fiction literature was taken from us at the age of 91. There can be no doubt that he was one of, if not the single greatest creator of speculative fiction produced by the 20th century, and along with the likes of Clarke, Asimov and Heinlein, one of the unassailable legends of the Golden Age of Science Fiction. And he was the last of them, which made his passing that much more painful. I'm not going to cover all the ground that's been covered by so many others in the past week. For the purposes of this blog, I'm going to talk a little bit about Bradbury's ventures into the realm of horror in particular. Although best known for his sci-fi, the author did indeed also have a great love for its more visceral, emotion-based cousin genre. In fact, it was from the works of Edgar Allan Poe that a very young Bradbury was first opened up to the power of genre fiction while nurturing his love of reading in the public library of Waukegan, Illinois. Yet another defining moment was his parents taking him to see Lon Chaney in The Hunchback of Notre Dame as a small child. Like Victor Hugo, Bradbury would also come to have his works adapted for the screen in later years--both big and small. Some of the more prominent adaptations would be derived from his works of horror--most notably the 1962 novel Something Wicked This Way Comes, which was turned into one of the most chilling horror films of the 1980s. But his relationship with the movies began even earlier, in 1953, and was connected with his horror dalliances more than anything else. A scene directly inspired by Bradbury's short story. It was in that year that not one, but two Bradbury-related projects would be brought to the movies. Both could be termed sci-fi horror, tying back into the writer's area of true expertise. The first would his film treatment, "Atomic Monster", which producer William Alland developed into the 3-D classic, It Came from Outer Space. A mere three weeks later, Bradbury's dear friend Ray Harryhausen would make a name for himself with the release of the seminal giant monster flick, The Beast from 20,000 Fathoms, based loosely on Bradbury's 1951 short story, "The Fog Horn". 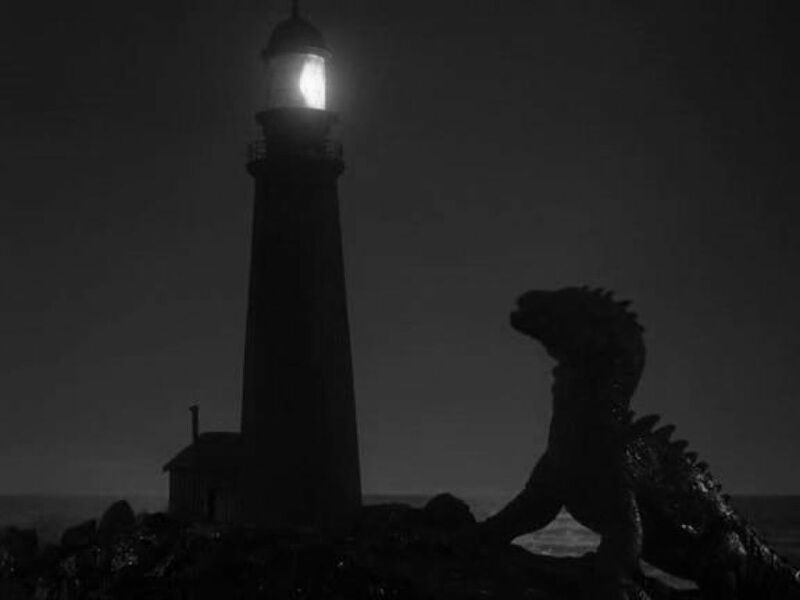 The Bradbury/Harryhausen friendship would become the stuff of genre legend (the two first met at the age of 18 at the home of none other than Forrest J. Ackerman), as would the sci-fi scribe's early association with comic strip icon Charles Addams. Before there was an Addams Family, Bradbury and Addams collaborated in the 1940s on a series of comically macabre stories revolving around a family called The Elliotts--collected in the 2001 volume, From the Dust Returned. 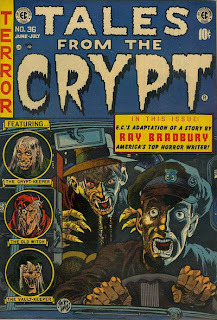 One of the EC issues featuring Bradbury's work. 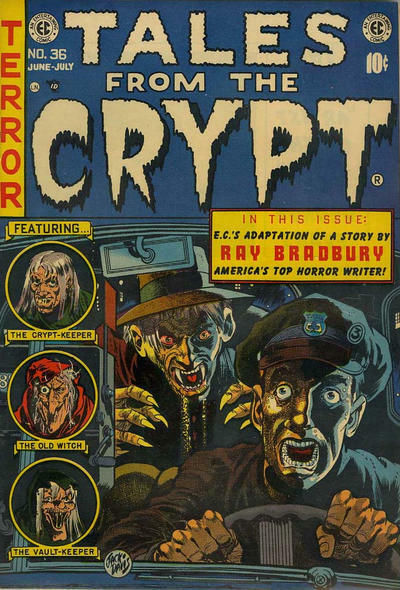 In the early 1950s, more than 20 Bradbury stories would be adapted in the pages of EC Comics such as Tales from the Crypt and The Haunt of Fear. One short story in particular, "I Sing the Body Electric," would become the basis for the 100th episode of The Twilight Zone, aired in May 1962. He also directly wrote the screenplays for a total of five episodes of Alfred Hitchcock Presents. Ray Bradbury was a shining light in the firmament of sci-fi, fantasy and horror. He was one of the last living connections to a truly amazing era in speculative fiction, and as The New York Times observed, may have been the one author most responsible for bringing science fiction into the mainstream. A giant of imaginative literature, he will be missed by fans of horror who have come to love and be inspired by his many fascinating forays into our genre.